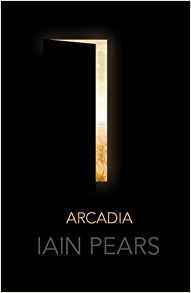 The new novel Arcadia by Iain Pears comes as a beautiful hardback from Faber with a very effective cover design (the thing that looks like a number 7 is a cut-away door in the cover, so you see through to the illustrated world within). This book is a strange mixture of fantasy and science fiction. One of the main characters, Henry Lytten, is a member of the dregs of the Oxford Inklings, the leftovers and second-bests after Tolkein and Lewis have moved on, at the cusp of social change in Britain in 1960. Lytten is writing an epic fantasy novel, creating a world unlike his predecessors where story is the governing thread, rather than magic or royalty. Interwoven with this storyline is one from the future involving a device that hovers vaguely between time machine and a way to enter alternative universes (the 'science bit' is very woffly). However, the alternative universes aspect seems increasingly to be the case as a girl from 1960 accidentally uses the technology to enter Lytten's fantasy world made real, after an intervention from a rogue future mathematician. For those who want to be trendy, there is also an app version of the book. The idea is that the text is broken into a whole load of relatively short segments which can be read in any order, so that the reader creates the experience, or some such guff. As you might guess, I think this totally misses the point of a novel. As a reader, I don't want to do the author's job for him. I want to be led - that's the whole point of reading a book. If I wanted to write my own book I would, and often have. The idea that somehow the reader is freed up by throwing away structure, just because this is a multi-threaded story just doesn't make sense. It's like the difference between listening to Ralph McTell* sing about taking us by the hand and leading us through the streets of London and just putting 'streets of London' into a search engine. The unstructured approach does not deliver a satisfactory experience. So, for me the app is a waste of time - and I suspect it will fall by the wayside as often happens with these attempts to take books into a new dimension. (Remember CD-ROM interactive books? Or ebooks with sound effects?) I could be wrong. It could be the next best thing since sliced bread, but I genuinely can't see the benefit. We return, then, to viewing Arcadia as a straightforward novel. It takes a while to get into because of the multi-threaded storyline, and to begin with it's hard not to feel that the fantasy world concept is a touch derivative, particularly when C. S. Lewis is deliberately brought to mind, but once the author's ideas kick in on the full scale, we discover an impressive conceit, with an enjoyable interplay of fantasy and different timeline versions of reality (giving us a chance to ponder just what reality is). However, I did find my interest levels dropping at times. Like Lytten's fictional creation is an epic book as far as length is concerned - 596 pages - but it doesn't have an epic topic. In fact, the fantasy world Anterworld is explicitly designed not to be epic. The result is to sometimes make reading an uphill struggle. Perhaps the book's greatest weakness, causing some of this lack of reading drive, is that none of the multiple protagonists is well enough drawn, or far enough from a two dimensional central casting character to strongly identify with them. Perhaps reflecting the author's idea of a fluid structure it's hard to really get behind any of these individuals. Admittedly, though, that's nothing new in fantasy and SF (think Asimov's Foundation saga - the characters are far more cardboard there), so it isn't the end of the world, and Pears has certainly come up with a genuinely interesting, original and well-detailed premise.